A relic casket excavated in Stupa No 2 at Sonari, 6 miles south-west of Sanchi in 1851 by Alexander Cunningham and F.C. Maisey. The casket, of lathe-turned steatite, has a globular body in two parts on a circular disc foot surmounted by a four-tiered knob, perhaps intended to suggest a four-tiered honorific umbrella (chattra). It was found to contain one piece of calcined bone. Incised on the upper part of the casket, in early Brahmi characters, is the following Prakrit inscription: 'Sapurisasa Majhimasa Kodiniputasa', ie, the relics of the worthy Majhimasa Kodiniputa. It may be presumed that the bone fragment found inside belonged to this much revered teacher. Another portion of his calcined bone is recorded by inscription to have been interned in a relic casket at Stupa No 2 at Sanchi. He is known to have travelled as a missionary to the central Himalayan region with four other monks after the third Buddhist Council held at Pataliputra (Patna) in the 18th year of the reign of the Emperor Asoka (273-232 BCE). The date of his death is not recorded. 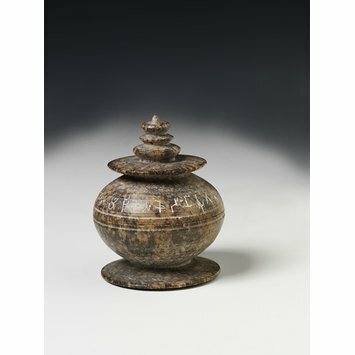 This and other relic finds of the period demonstrate that the interning of relics in containers and placing them in stupas was a widespread practice in the late Mauryan period. These were not confined to “original” Buddha relics but also included the corporal remains of revered followers of the Buddha. 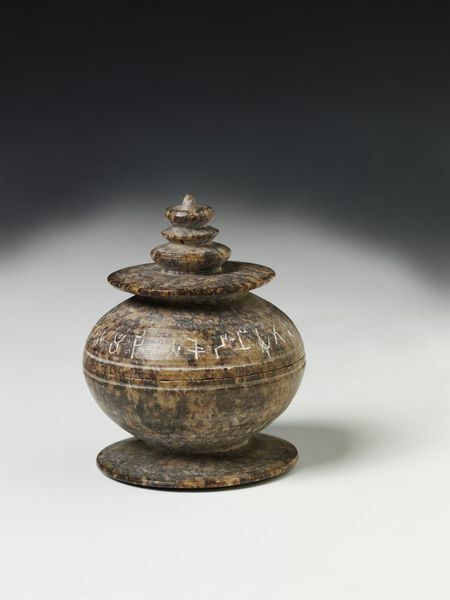 The casket, of lathe-turned mottled steatite, has a globular body on circular disc foot surmounted by a four-tiered knob, perhaps intended to suggest a four-tiered honorific umbrella (chattra). It was found to contain one piece of calcined bone. Incised on the upper part of the casket, in early Brahmi characters, is the following Pali inscription: 'Sapurisasa Majhimasa Kodiniputasa', ie, [the relics] of the Emancipated Majhimasa. It may be presumed that the bone fragment found inside this reliquary belonged to Majhimasa, the much revered teacher alluded to in the inscription. Another portion of his calcined bone is recorded by inscription to have been interned in a relic casket at Stupa No 2 at Sanchi. He is known to have travelled as a missionary to the central Himalayan region with four other monks after the third Buddhist Council held at Pataliputra (Patna) in the 18th year of the reign of the Emperor Asoka (273-232 BCE). The date of his death is not recorded. Relic casket of mottled steatite, turned on the lathe, containing one piece of calcined bone. It was found inside the relic casket, Museum No. IM.219-1921 by General Cunningham and General Maisey about 1851, in the Stupa No 2 at Sonari, 6 miles SW of Sanchi, Bhopal State, Central India. The casket may date from about the year 200 BC and the stupa may be a few years later. Globular body on circular disc foot, surmounted by a four-tiered chattra or pinnacle. Incised on the upper part, in early Brahmi characters, is the following Pali inscription: 'Sapurisasa Majhimasa Kodiniputasa', ie, [the relics] of the Emancipated Majhima portion of whose calcinated bone were found in a relic casket from the Stupa No 2 at Sanchi. He went as a missionary to the Central Himalaya District with four other missionaries after the third Council held at Patna in the 18th year of the reign of the Emperor Asoka (273-232 BC), but the date of his death is not known. Willis, M. (ed.). India: the Art of the Temple. Shanghai Museum, 2010, ISBN 978-7-5479-0092-5. cat. 1.20. Buddhists deposited the remains of venerated teachers in reliquaries and then enshrined them in large hemispherical mounds called stupas. These reliquaries were all excavated in 1851 from stupas near Sanchi, one of the most important early Buddhist sites in India. The large container (1) held beads and five smaller reliquaries (including 2). The crystal reliquary (3) contained minute bone fragments. Its shape, including the umbrella finial, resembles that of a full-size stupa.